Is your asphalt driveway beginning to crack? Repairing cracks in Frankford driveways and walkways quickly can prevent further separation of the surface and additional problems. Tom McDonald Contracting specializes in crack repair and seal coating. Crack repair is one of the most important steps in maintaining your asphalt surface. Regular maintenance of the surface will extend the life of your driveway or parking lot. Before you have that asphalt seal coated, be sure to have the cracks repaired. Why spend money to repair driveway cracks? Because regular maintenance will extend the life of your asphalt driveway or parking surface, actually saving money in the long run because you won't need it resurfaced as frequently. Moisture may penetrate under the surface, leading to deeper cracks and further damage to the asphalt, especially when temperatures may fall below freezing. 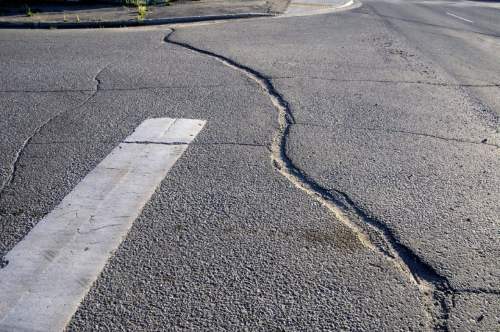 Vegetation may begin to grow in the cracks, which doesn't look attractive, but more importantly, the roots can cause greater damage to the asphalt by pushing the asphalt upward. Call (302) 219-7939 to learn about pricing for crack repair of your Frankford blacktop or asphalt surface. You'll be surprised at how inexpensively Tom McDonald Contracting can repair your cracked surfaces and provide a protective barrier for years to come. Tom McDonald Contracting has been providing crack repair of Frankford driveways, walkways and parking areas since 1990. Our Frankford sealcoating crews are highly experienced, expert crack repair professionals. We work with only grade A materials and the latest equipment to cost-effectively complete the task. You'll be assured to have a beautiful, durable, end result. For fast, friendly, reliable customer service, and an experienced technical staff, call Tom McDonald Contracting for your crack repairs in Frankford, Delaware. A rating with Better Business Bureau! 5★★★★★ - "Very Very Pleased with the service all the way around, From the very first call I made to the company, to a very professional installation. The gentlemen who performed the installations were very helpful and polite. I could not ask for better service. Also, my home looks much better now !!! Thanks, Guys, You are highly recommended and appreciated!" 5★★★★★ - "Absolutely the best driveway sealing I have ever had done. Absolute quality. No messes or splatters. Estimate and work completed in 48 hours and everything was made very easy to do business. Worth every dollar spent on it. Will absolutely use them moving forward for all my sealing and paving needs." 5★★★★★ - "I called Mr McDonald for an estimate on gutter guards They came out on time, very professional. I hired them and their work was outstanding, they did a great job; I give them 5 stars"
5★★★★★ - "Michael McDonald came out and put gutter guards on our house we are very pleased prompt service fair price looks great 5s"
5★★★★★ - "I had gutter guards put on my house, Michael McDonald was very professional and did a great job- very pleased 5s"
5★★★★★ - "Tom very responsive he was quick to get back." 5★★★★★ - "Quick response, willing to negotiate, immediate service and nearly done. No mess looks good." 5★★★★★ - "Mr. Mcdonald was absolutely wonderful to work with he was very professional on time very knowledgeable his work is outstanding!! I would recommend him to all my friends I have all ready scheduled for next year to have my driveway done again. Thank you Mr. Mcdonald"
5 ★★★★★ - "Michael arrived very quickly. Did a great job, very neat and a reasonable price. I would definitely recommend him." 5 ★★★★★ - "Mike came by and gave me an estimate, it was the best job I ever had sealing my driveway. I am very happy. 5*'s"
5 ★★★★★ - "I called McDonald Contracting for an estimate on my driveway, they responded right away. They came out, gave me a fair price, and they took care of it right away. Their service is excellent. Job well done. Overall I would give them 5 stars. Thanks guys! " "Our experience was very good, it is hard to schedule these types of project when you are long distance, but working with Mike everything went smoothly and on-time." "Tom was quick to respond to our inquiry. He showed up exactly on time. His work was excellent. Our driveway looks brand new." 5★★★★★ - "Great job! Made our very large driveway look brand new. Very efficient and reliable. " ★★★★★ - "Our driveway looks great. The process and the product was clearly described. The work was done professionally and promptly. Very good value. " ★★★★★ - "I called to have my driveway sealed Tom McDonald came out and took care of it his work is fantastic my driveway looks like brand new very professional on time very happy with the job will definitely use again thanks Bob walker"
5★★★★★ - "I had McDonald Contracting do our driveway. They did a fantastic job. They were very professional, on time and did everything they said they would do. I Would Highly Recommend Them. Thank you." 5★★★★★ - "McDonald contracting came out and worked on my driveway. And I'm very impressed with this company. There professionalism there cleanliness and wonderful work. Definitely would recommend to anyone looking to have great work done at a fair price." 5★★★★★ - "He was prompt did the job right away explained what he was going to do and didn't try to talk me into doing anything more than I wanted. I appreciate him doing only what I wanted." 5★★★★★ - "Very prompt , neat." 5★★★★★ - "Tom was hear on time and did a great job sealing my driveway. I contracted him for next year (2016) to treat my driveway again. He is all the above--customer service -- work quality-- price I give him a 5 star rating."